Hello Yarn Fans. I’ve been stitching with Unforgettable, a yarn made by Red Heart. 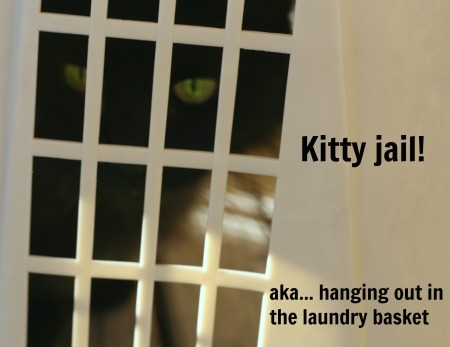 Its part of my I’m-Not-a-Yarn-Snob campaign. I’m making a hat, a Victorian styled nightcap, with this and one other modern acrylic yarn. Yes, I may not be a yarn snob but I am a yarn geek and so making up a vintage item with two modern yarns in wild colors makes me feel so very clever. I’m enjoying it. Nearly every crafter who checks out my in-progress hat asks (a) how is that Unforgettable yarn and (b) when are you going to get the pattern done. The answer to (b) is …. I don’t know. Soon. Depends of how many sleepless nights I have and if I get distracted by something else (like another project). The short answer to (a) is yes, in certain circumstances its a great yarn. The long answer? Well that’s what I have a blog for! Weight = 4. I’d call it a DK weight. Its definitely thinner than most worsted weight yarn. Its sold in balls of 3.5 oz (100g) with 269 yds (246m). Material = 100% acrylic. Its shiny and very soft to the touch. I think of it as a fake silk. I always mentally categorize acrylics by the fiber they are trying to mimic. This one is a silk-mimic. Construction = single ply. Its a loosely spun, single ply with some, but not much, halo on it. The thickness is pretty consistent; not too much thick’n’thin going on with this yarn. 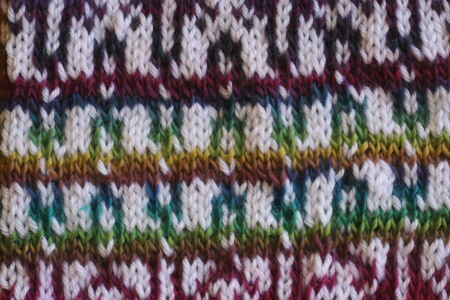 Colorways = long color stripes. There are 15 colorways sold (I think). I’m working with Stained Glass (E793-3943). This is a long colorway yarn but maybe not as long as you’d expect. Each distinct color is only yard or two with gradual transitions into the next color. I was pleasantly surprised by how Unforgettable works up. Its a loose spun, single ply acrylic and I was expecting it to be splitty. Its not. I occasionally put my needle tip through the yarn and have to back out, but only rarely. And the yarn isn’t grabby so when I do make a mistake, its easy to pull a stitch free and fix it. I do want to add that I’m using metal tips and sharp points. Specifically I’m using addi Click Lace Short Tips and they are very smooth needles. I think smooth tips would be a must when working with Unforgettable. 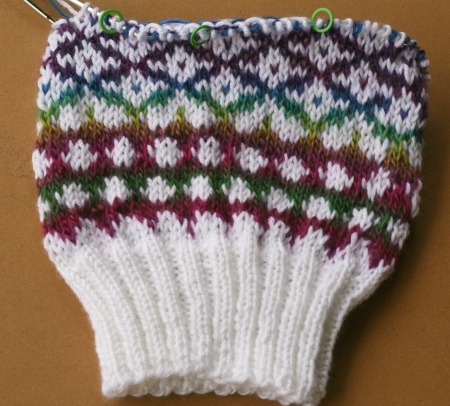 Here is a look at how its working up for me in my in-progress nightcap (this is pre-blocking of course). It has nice stitch definition and, being a single ply, the stitches really pop out. I did a small sample in crochet. 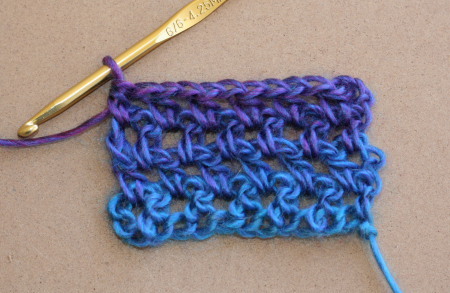 This is just half double crochet stitches with chain spaces. I think it looks even better here than in the knitting. But I’m not following the recommendations provided on the ballband. Unforgettable recommends a Size 8 (5mm) knit needle and a Size J (6mm) crochet hook. That just does not work for me. In my samples here I used a Size 6 (4mm) needle and a Size G (3.75mm) hook. As I mentioned above, this yarn is thinner than most worsteds so I went down a size. Or two. Or three. A Size J hook with this stuff is just crazy-underpants-talk to me. It would not work with the way I crochet. Unforgettable has great draping qualities. Scratch that. It has fantastic draping qualities. Because of the way its made, its very soft and very smooth and it will hang beautifully in any lace you make. Being so soft and smooth and drape-y I think makes it ideal for crochet lace. This yarn has no elasticity whatsoever. None. Zilch. Nada. Don’t use it for anything that requires negative ease because it won’t cling. Think of it as silk. There is no stretchy-clingyness to silk and there is none in this yarn either. Unforgettable is a delicately made yarn. That’s probably why its so soft. Don’t use it in any hard-wearing garnets. Don’t use it in anything that will need to be washed a lot. It will pill. Think outerwear. Think scarfs and shawls and hats and slouchy leg warmers. No gloves. No sweaters. No socks. So if I convinced you to give Unforgettable Yarn a try the good news is that its also pretty inexpensive. You can buy it online direct from Red Heart for $6.19. But I looked around and there are better deals out there. Jo-Anns is currently selling all Red Heart Boutique yarns, including Unforgettable, for 25% off. I don’t know how long the sale lasts but as of right now Unforgettable is $4.87 and they have 12 colors in stock. Micheals also has Unforgettable on sale and its currently $3.99. I think that price/deal is only good for on-line sales and you won’t get it if you buy from a store. Walmart sells it and that’s where I bought mine. If you check online, they have multiple prices for Unforgettable. It seems to range from $4.97 to $7.78. I have no idea why. At my local store its $5.19. Anyone else have experience with this yarn and like to share? I’d really like to hear more opinions. 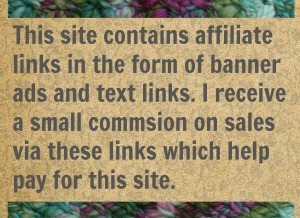 In fact, if there is an interest, I’d love to make independent yarn reviews a regular thing here. 31 Comments on "Is it Really Unforgettable? a yarn review"
That Candied is a nice set of colors. I’ve fondled a ball of that once or twice and I’m sure I’ll break down and buy some soon. I haven’t had any breaks yet but that is always a concern with a single ply yarn. Lionbrand Landscapes is far thicker than Unforgettable… right/ I know they are both “worsted” but that Landscapes is only 147 yds per 100g. That’s more in line with a bulky weight. 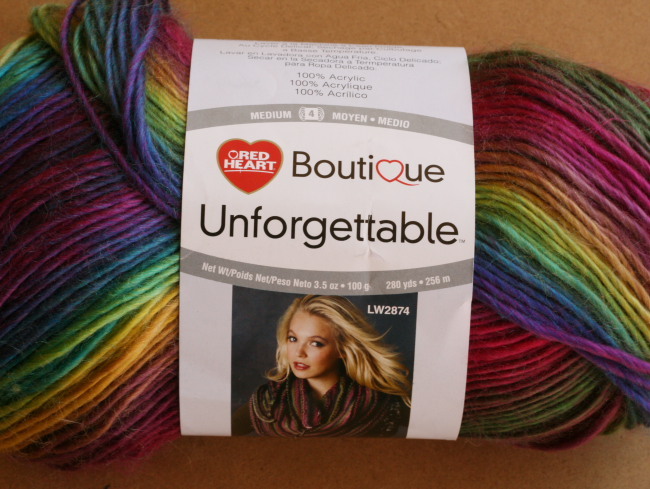 I’ve been doing yarn reviews on my blog for a few years now, and I reviewed Unforgettable last spring! It’s interesting how people can get such different experiences based on what they make worth a particular yarn. Just read your review and what stuck me most was your notes about frogging. I can certainly see that. Its far to delicately made to stand up to being frogged much. That soft hairy-ness becomes unsightly ragged-ness . Or at least it has all the other times I’ve frogged with a loosely spun single ply yarn so I’m sure it happens with Unforgettable too! Thanks for teh heads up. 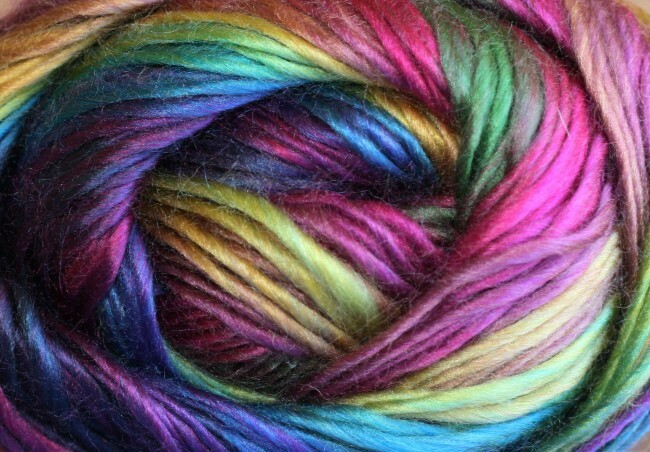 I am such a sucker for a rainbow colorway yarn. Have you noticed? Those Chibi bent tips are the best! Sorry. Had to get that out of my system. Okay. Maybe we’ll have more yarn/geek reviews. Because we all, everyone of us, like to pretend that we are discerning consumers of yarn and not obsessive hoarders that in truth would buy all of it if we could. My only problem with the Chibi needles is figuring out, from the package, which are the nice, smooth metal, and which are the nasty, snaggy plastic ones. Got some recently, because who knits in only one spot? They were plastic, and really rough. I smoothed them, but still grumpy. Yes To the smaller hook! I tried to work this yarn in a J (after I wrote my own post, lol) and it was just a sloppy nothing-burger. Maybe that note on the ballband is a miss print?